Home prices over time in Houston’s west side district the Energy Corridor steadily increases over time as shown by the Real Estate Center at Texas A&M University market research. The study tracks home prices over time in the Energy Corridor. The report shows the number of home sales also the average and median home prices by month. Beginning in January 2015 the report also reports the total number of available homes for sale including the months of inventory. Months of inventory represents the number of months it would take to sell all available homes. That means if no more homes become available in the market the supply of homes to purchase would be depleted in that number of months. The benchmark of six months is used to determine a buyers market or a sellers market. 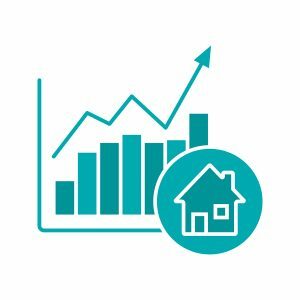 The report shows inventory in the district has changed over time but home prices have steadily increased. Giving home owners a good rate of return on their Energy Corridor real estate investments. Real estate market growth chart color icon. Houses price rise over time.